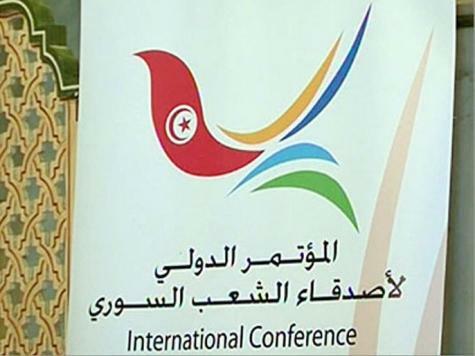 Saudi Foreign Minister Prince Saud el-Feisal walked out last night from the "Friends of Syria" conference in Tunis, deeming it a washout. I can see Syrian President Bashar al-Assad wreathed in smiles watching another failed conference. He is right to make fun of us. A year of farcical meetings passed without any organization, power or nation in the world challenging his doings. While his tanks brazenly pound cities, we suffice with argumentative meetings. Syria’s state-run TV was relaying statements of the “Friends of Syria” conference in Tunis without qualms since the statements were conveying frustrating messages to the blockaded Syrians. It would have been a pertinent conference for people hit by famine or an earthquake, not people facing death by heavy weapons every day. Assad is wreathed in smiles as he sees world demands retrogressing. He is now entreated to agree a pause in the fighting for two hours each day to allow relied aid in to the needy. In addition, the Tunisian president offered to receive the Syrian president and his family in Tunis. It sounded like Tunisia’s own Zine El Abidine Ben Ali or Yemen’s Ali Abdullah Saleh being under siege waiting for a travel ticket or a visa. Why would Assad accept the Tunisian president’s invitation and leave Damascus when no one is daring him militarily except thousands of unarmed protesters in the full view of the world media. The utmost letdown was to hear Arab League Secretary-General Nabil Elaraby say the Arab plan is the only solution – one allowing Assad to cling to power and dangle a morsel of meat by co-opting government ministers from the opposition. This is Syria’s sad tale: yearlong meetings, conferences, solutions and plans while thousands of people get killed, wounded or detained. It’s the sad tale of a population under siege for a year with no letup. Worse still, the siege is two-pronged: internal and external. The population is prevented from receiving outside help and is prohibited from requesting international intervention. The Arab League too remains close-fisted, denying even a chair to the people’s representative. Nor has the League offered any kind of assistance to the population, whether civilian or military. Meantime, Russian and Iranian warships continue plying the waters of the Syrian coast to supply the regime with weapons, men or cash without hindrance or objection. The only way to protect the Syrian people is either through international military intervention to stop the massacres, as was the case in Bosnia and Libya, or through arming the population to defend itself. All other options will perpetuate the crisis and condone the regime massacres. Humanitarian corridors won’t stop the regime killings. They would simply help tend the wounds of the victims. Of course, we are all concerned about arming the population. But there is no other choice. The Arabs lack the muscle. Turkey and NATO don’t want to intervene either, and the Russians are bent on blocking any Security Council resolution mandating international intervention. All this leaves one solution: arming the Syrian groups by all ways and means. The right of self-defense of person, property and honor does not require endorsement by the Security Council or anyone else.